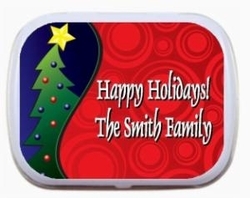 Deck the halls with our famous Personalized mint tins! Our personalized mint tins can be personalized with your Holiday greetings, Office party sentiments or company logo and they are a trendy favor to give this season. Hot, hot, hot! This fun design is decorated with beautiful, bright holiday colors. On the left side is a funky Christmas tree all decorated and ready for the big day and the other side is a bright red swirl which can be personalized with 2 lines of your text. Choose your favorite candy choice and mint tin color.